We were here in the beginning. Before the first patter of unwebbed feet upon the dirt, my people swam the waters of Ixalan and listened. The Nine Tributaries taught us their secret names, and in return we promised to call upon them only in need. We whispered to the roots as we stepped among them, and they curled away to clear our path—not because we were their masters, but because we alone knew how to ask. We spoke to the wind and the waves and the tangled branches. We shaped them to suit our needs, and they shaped us to suit theirs. The beastmasters forget that we were here before them, though they once knew. The bloodsuckers and the brigands, perhaps, have never known—though they, too, have forgotten many things that only we remember. We are mighty, but we used to be so much more. I wonder, at times, what it was like before the beastmasters had their turn. We ruled these lands, and once controlled its fate. I wonder what sort of Shaper I would be had I lived in those days, had I known what they did. It is useless to speculate, of course. My present is all I can truly know. Tishana has done her best to teach me that. The "whys" and "what-ifs" cannot change the course of a river. There are nine of us Shapers who lead the nine great tribes. The Tributaries kindly share their names with us, each of us speaking for one of them, each of them guiding one of us. I was called something else, not so long ago, when I was but another shaman swimming these rivers. But the river Kopala chose me, as it chose Kopala before me, and so I am Kopala, and Kopala is me. Kopala is a languid little river that meanders down from the highlands, pausing for reflection in small lakes along the way. We are of a kind. I was meditating when its waters found me, creeping toward me, filling the little glade in which I sat. I opened my eyes and saw myself reflected in still waters, the river and I becoming one. There is no use in "what-ifs." I am a Shaper, and it is the only path I will ever know. I am proud to wear that mantle. I am the youngest of the Shapers, the least of the greatest of my people. I still have much to learn. My tribe depends on me. The other Shapers depend on me. Ixalan itself depends on me. That is why I am floating here, in the mystical waters of the Primal Wellspring, meditating. Tishana, my mentor, is here with me, guiding me, though her body is sitting in the canopy far above. I can feel everything—the Great River, the Nine Tributaries, the swaying of the distant Deeproot Tree, the gentle motions of the tides and the winds. 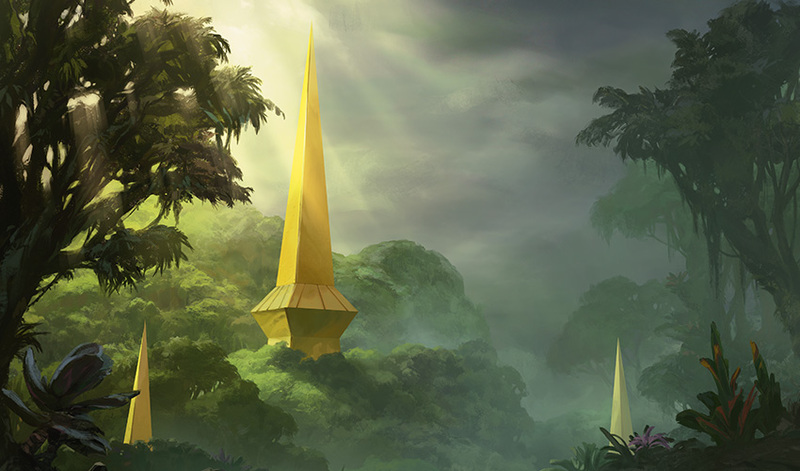 Emanating from a place that no living soul has seen, I feel the heartbeat of Ixalan, the steady thrum of the Golden City of Orazca. The power of Orazca is unlike any other. It is separate from the wind and the waves, the ephemeral exertions of life and the deep, slow grinding of the earth. It is many things to many people—its truths remain shrouded from our view. But what it is is beyond words. It is a steady pulse, a rhythm, that can be heard throughout the world by those who know how to listen. The pulse skips a beat. Then Tishana is there with me, guiding me back, reminding me wordlessly to see the strangeness, to feel it, to reflect upon it—and, like water in the Great River, to let it flow over me, down the channel, to the sea, where all things must eventually return. My eyes close. We meditate further. I cannot help but wait in expectation of another missed beat. It does not come. Soon after, Tishana's presence wanes, and our meditation comes to an end. My eyes open, and my body returns to me. I swim down to the river bottom, kick off in a cloud of silt, and move from below to above. The air in the glade around the Wellspring is so humid I feel I hardly need my lungs, though of course the breath of mist that crosses my gills is not enough to sustain me. I breathe, in and out—a focus for meditation in the Sun Empire, I have heard. Our techniques, which must serve us both above and below, focus on the heartbeat. Tishana steps down a path of curving branches, which bend to deposit her gently on the bank. Her posture is stooped, her features wizened. She is the eldest of our people, old enough to remember when many of the trees in this glade were saplings. "You felt it," she says. "Yes," I say. "What was it?" "A disturbance of the intangible," she says. "Like a dolphin trying to break through the riverwater's surface, although it cannot breach. I do not know what it means. But . . ."
She pauses, giving me the chance to speak. When I first began training with Tishana, I had waited through these silences out of deference, but eventually, I realized that if she thought I knew the answer, her silence would continue indefinitely. "But it involves Orazca," I say. Orazca. The Golden City. The place our people have sworn to keep secret, even from ourselves. "And what involves Orazca involves the whole world," says Tishana. Tishana turns, and then I feel it too—a rush of magic from the north. A ripple moves through the jungle, a large group in motion, coming closer. Then they are at the edge of the glade, a group of about twenty River Heralds. They stand in formation, surrounding something I cannot see, guarding it. At their head stands Kumena, their Shaper. He is lean and lithe, with piercing eyes and a commanding attitude. The river Kumena runs rapid over jagged rocks. It is a vicious obstacle for our enemies, and a hazard even for us. 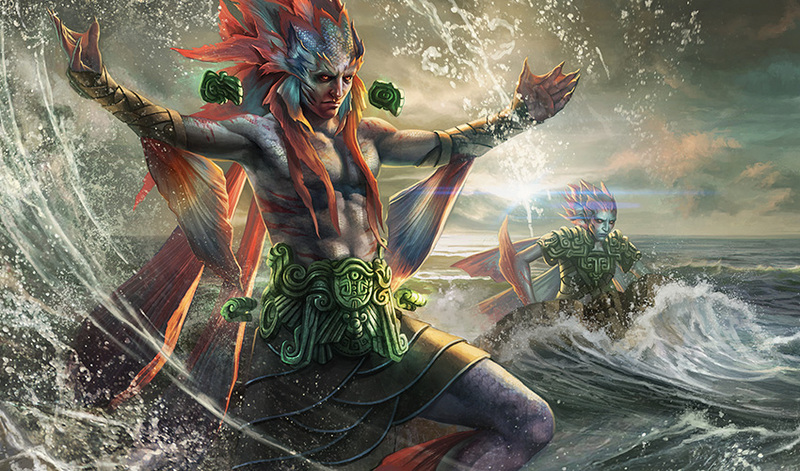 The Shaper Kumena is no different, and he is perhaps the most powerful among us, save Tishana. "Shaper Tishana," he says, his voice booming through the clearing. He nods to me, as an afterthought. "Shaper Kopala." Tishana's people and mine, arrayed around the Wellspring, are watching and listening. Tishana inclines her head. I bow. "Shaper Kumena," says Tishana. "How fortunate that the Great River has brought you here." "As it guides us all," says Kumena, automatically. There is no deference in his voice, to either the Great River that guides us or to the Shaper who leads us. "What brings you to the Wellspring, Shaper Kumena?" asks Tishana. Kumena points a finger at his people, and they part, revealing a bundle on the ground. No, not a bundle—a man. A soldier of the Sun Empire, bedraggled but whole, bound with a tangle of vines. His eyes are full of hatred. "I caught this," spits Kumena, "on the west side of the Great River, with a company of his fellows and their beasts. And you know what they were looking for." "They have long sought Orazca," she says. "One patrol on the far side of the river hardly means they have found it. Like the bloodsuckers, their zeal will not translate into success." Kumena turns to his captive. Their eyes lock, mutual hatred perfectly reflected in them. "Tell them what you told me." The man sneers, but speaks. I do not know what Kumena has done to him, or to his friends, but there is fear beneath the hatred. "Forces are converging on your Golden City," says the man. "Our spies tell us of two pirate captains . . . the stories are incredible, but they seem to be true. One is a man with the head of a bull. The other is a woman with hair like twisting vines who can kill with a glance. The woman has a device, a compass, that she says points the way to the Golden City. She was discussing it openly in their floating city." A murmur goes up among the assembled River Heralds. They have spies of their own, and had heard similar fears. But Kumena glowers at the man. "And?" he demands. The man flinches. "One of our own, a champion of the sun, performed a spell that revealed the Golden City," the man says. He cannot keep an edge of pride out of his voice. "She will go to its gates." Kumena spreads his arms wide, turning away from the man. "The situation has changed," he says. He is speaking to Tishana, but loudly—loud enough for everyone in the clearing to hear. "Orazca is threatened. You would have us protect it without even knowing where it is." Tishana's eyes narrow. She does not raise her voice, but it is louder than his. They call her the Voice of Thunder. Even her whispers can fell trees, if she wishes. She is letting a tiny gust of that power loose. 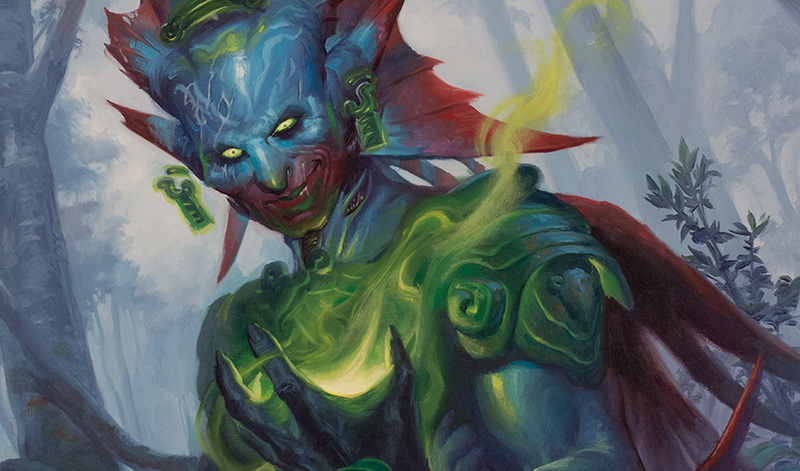 "I would have us safeguard Orazca from all who would abuse it," says Tishana. "Even ourselves." "It's too late for that," says Kumena. "We already know that the bloodsuckers have a visionary guiding them. Now the beast-riders have one too, and the plunderers have this device. We are vastly outnumbered, and they are more zealous than ever. If this current keeps flowing, Orazca will be discovered." "And what would you have us do, Shaper Kumena?" asks Tishana. "Please, grace us with your wisdom." Kumena swims in tumultuous waters and surely knows it. He presses on. "The time has come," says Kumena. "We must wield the power of the Immortal Sun ourselves, or we will see it fall into enemy hands. The sun will tumble from the sky, the waters will run cold, and this land that has cradled us will become our grave. Unless we act now, decisively. We have no choice!" Tishana remains calm. She is firm, unafraid, unflinching. Another what-if crosses my mind. What if I were the one standing against Kumena? What if I must do so now? "Remind us, Kumena, why outsiders finding Orazca would be our doom." Tishana's voice is only growing louder. Her eyes are stars, and her voice a crashing wave. I take a step back, but Kumena does not shrink away. "They would misuse it!" he hisses. "The Last Guardian entrusted it to us, and if we let it fall into outsiders' hands, then we are derelict in our duty. They will destroy us and all the world with us!" "He entrusted us to keep it hidden," says Tishana, with the inevitability of a hurricane. "To keep it unused, Kumena. You have forgotten your place. You have forgotten our duty." The water in the Wellspring has begun to swirl around Tishana. The air moves over my gills faster and faster. Now Kumena does step back, but he turns to the assembled Heralds. To me. "Surely you must see it!" he says, to me. "This philosophy of inaction is meaningless if the city becomes a weapon in the hands of our enemies! Will you help me defend our people?" He is staring at me. Tishana is looking at me too. My game of what-ifs must be spoken aloud. I know I must make the call, break the tie, be the deciding voice. A leader is decisive and just, and I must be so too. My words are like myself. Fluid and fair, even and just. "I cannot deny the truth in Kumena's words. If outsiders take the city, only misery can result. The Immortal Sun has brought ruin to this land once before, and we barely survived. For anyone to use it again would mean the end of everything we have built, and the failure of our vigil. "And yet. If the Last Guardian had meant for us to wield it, he could have entrusted it directly to our care. The history of the Immortal Sun is the history of its misuse by mortals. I am not so arrogant as to think that we alone might safely bear the weight of this responsibility. "Shaper Tishana is right," I say with confidence, "We must do everything in our power to prevent anyone from claiming the Golden City. That includes us. And I cannot trust anyone who is so eager to lay hands on such power." I feel my people's pride in my voice. I see Tishana's pride in her eyes. But I sense I have chosen the wrong side. Kumena's eyes flash, and then everything happens at once. 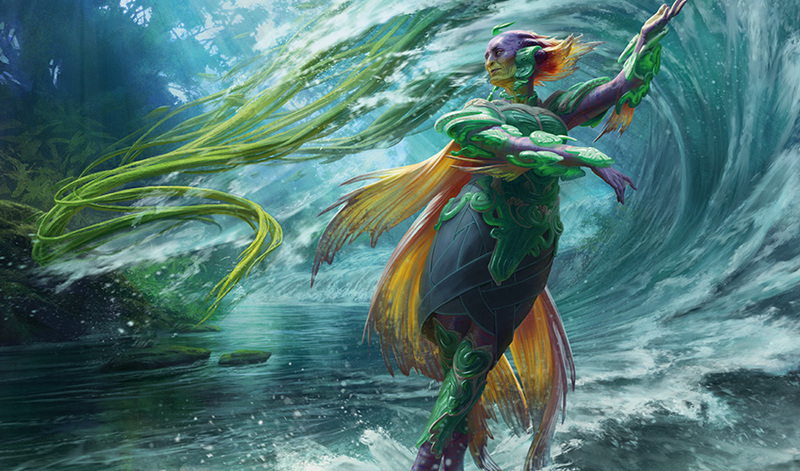 Kumena waves a hand. The sun warrior is pulled beneath the surface of the Wellspring with a strangled cry. Kumena's people hang back, unwilling to join him in his rebellion. 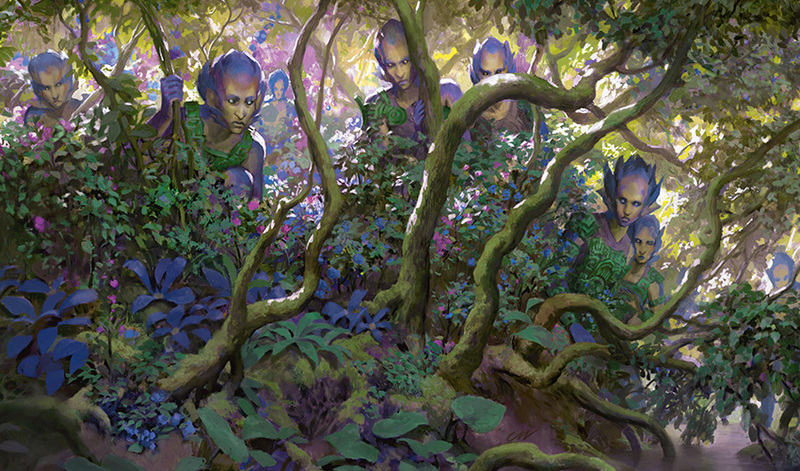 Tishana's people and mine rush into the glade. Wind and water swirl around us. Tishana suddenly stills, as does Kumena a moment later. I feel a tug at something in my chest: a connection, a spider-thread plucked like a bow. For a moment we all wait, sensing, knowing in our hearts that someone is approaching the shores. Tishana places her hand on the surface of the water. Her eyes snap open. "Vessels approach our coast. Kumena, if these are your interlopers—"
"I will deal with them, but this strategy will not last us the next hundred years. It will not last us one. You have all been warned." 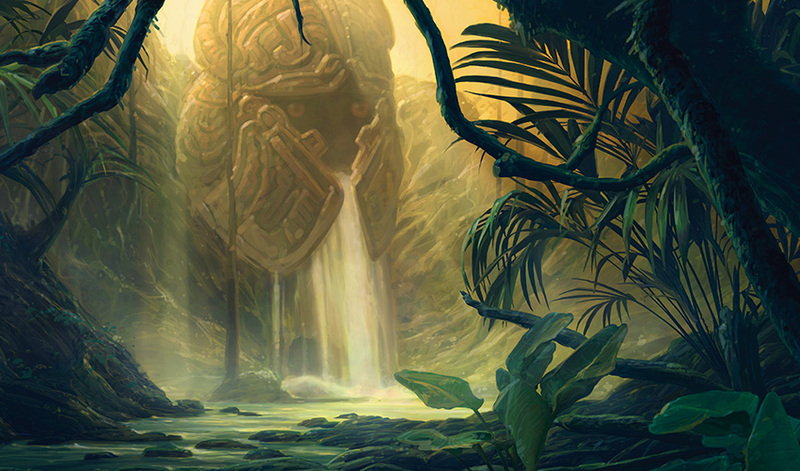 Kumena speaks one last word, and a shell of water and vines springs into existence around him. There's a flash of magic, a swirl of water, and then he is gone from the glade, rushing through the jungle in a wave of tangled roots and rushing current. I reach beneath the surface with my magic, looking for the sun warrior, but his body is still and waterlogged. "Is he headed for Orazca?" "If Kumena could find Orazca on his own, I think he would have done so already," she says. "And even if he can, he will seek to hobble his rivals first." "You think he will seek out these others who seem to know the way," I say. "Yes," says Tishana. "I'm going after him." "You? But Shaper, you are—"
"Old," she says, with a twinkle in her eye. "I know. But I'm not decrepit, Shaper Kopala. Not yet. I will go. Only I can hope to overpower him." "I'll go with you," I say. "Stay here," says Tishana. "I need you to rally our people and be ready to move. If Kumena takes Orazca—if anyone does—it may take all of us to win it back." "No," I say. "Shaper, please. You have kept it secret for a reason." Tishana lays a hand on my shoulder. "Kumena is right about one thing," she says. "I do not think we can keep the Golden City hidden any longer. And if we cannot keep it hidden, then we must hope the Great River will grant us all the wisdom to guard the city without using its power." "Wisdom that one of the greatest among us lacks," I say. "I cannot bring myself to call that hope." "Call it what you will," she says. "We have a way forward and a current at our backs." Then water and vines envelop her, the trees bend in deference to let her pass, and she is gone. Our people are looking to me. "Rest," I say. "Meditate upon what has happened here. In the morning, I will send messengers to all the tribes. We will do as Shaper Tishana says." Most of them murmur agreement. Some grumble. Kumena's people have already slipped away. Beneath me, I let the roots and vines gather up the body of the sun warrior and pull him beneath the bottom of the pool to rest, and to nourish the trees that grow here. It is not the end he would have hoped for, but it is the best I can do. I sink beneath the surface of the Wellspring. I can feel everything—the Great River, the Nine Tributaries, the swaying of the distant Deeproot Tree. Our two greatest champions race away from me, bending the jungle away before them and replacing it behind them, heading east. What if I had joined my mentor? Wind whips at the membranes of my fins and the redolence of low tide curls my toes as I approach the one student I failed the most. I track Kumena quickly, simply—a straight line from where we were to where we are. Kumena's immaturity is as plain as his ego. He is a powerful Shaper, yes, but he is artless, naive, as impetuous as his namesake. At their best, those chosen to bear the name of Kumena are freewheeling, passionate, biased toward action. This Kumena is all of these things, but with a sharp edge that makes him dangerous. When he was my student, he tested every boundary. I have fond memories of most of my students, but my memories of him are brimming with headaches and resentment. I would not go so far as to say I failed as a mentor, but rather that I succeeded only as much as one could have. Maturity cannot be taught; it must be developed. In front of me spreads the great expanse of the ocean. It is beautiful, baleful, avoided—our preferred waters are murky and fresh and without the harsh salt of the coast. He stands in front of me, arms raised, agitating the sky and the waves into a frothy roil. 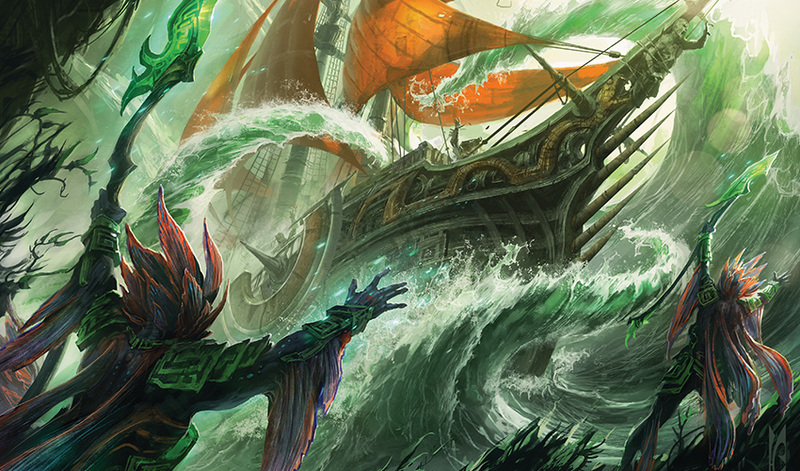 "We can conjure a thousand storms a thousand times, or we can raise a city only once," Kumena says over the roar of the sea. "Which is the better expenditure of our energy? Which is better stewardship, Tishana?" "Awakening Orazca is not an option." I subsume his spell with magic of mine own. My waves pull the enemy ships close, and my rain slaps their sails. "I will not let you imperil more lives. I will not let you answer contingencies with contingencies and outrages with outrages." I sense him slip out of the spell, step back, look onward with awe at how my magic now tumbles the ships in the distance like leaves on a whitewater river. "You always had more skill than I," he says, hushed. I ram one of the ships into the side of a sea stack. "You think yourself wiser than your elders," I say. "That will be your downfall." "And your age will be yours." I look over my shoulder just in time to see Kumena's fist hit my face.